The Quirky Conversations of Psych: Is McDonald's Grimace Black? I was watching Pysch on Demand tonight (whoo hoo exciting Saturday!) and Shawn and Gus were debating on the race of Grimace. Gus insisted that Grimace was "a brother." Shawn said, "I'll give you Vin Diesel. But Grimace? No." 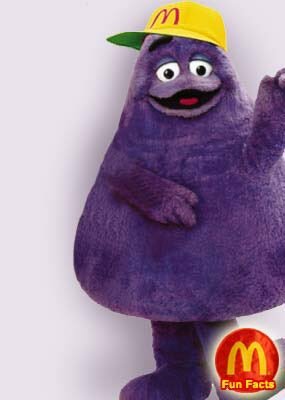 Later in the episode, Gus declared that Grimace's name was "Grimace T. Jackson" thus proving he is black. So fricken funny. I LOVE that show. Research: So, What IS Grimace??? I believe Grimace is not of any earthly races. He is from outerspace, sent here to scare the living daylights out of small children at McDonald's Birthday Parties. Case in point: one birthday party, my brother was so terrified of Grimace, he held on to my mother's neck and squeezed to the point she almost choked. There's a meme for that.